Do I need a vehicle permit for Mexico? 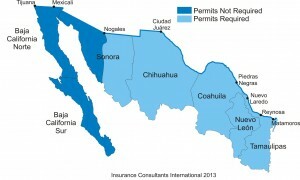 What about Permits for Sonora or Puerto Penasco, or Baja. 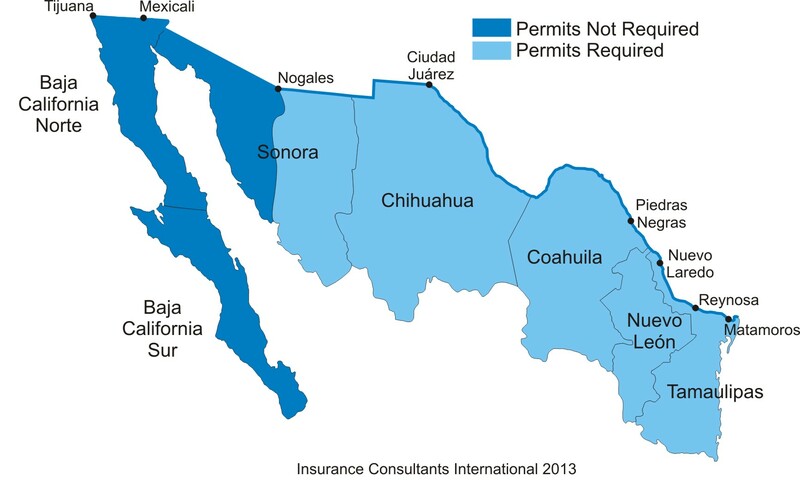 You also don’t need a Vehicle Permit if you are specifically traveling anywhere in Baja, or certain areas of Sonora, such as Puerto Penasco. Please view the map above, and check banjercito (link below) to make certain that all information is up to date. Can I get my vehicle Permit before I leave home? Yes. You may apply for it online through this link, Banjercito. You will, however, still need to stop at one of their locations as provided below. What your doing is limiting the amount of time your waiting in line, since you will have already presented most of your information prior to entering Mexico via Banjercito. You must allow them 10 business days to process this application prior to their issuing you the permit. How many days may I request for this Permit? Mexicali – Annex 8am-4pm Monday -Friday, 10am-2pm Saturday, Closed on Sunday. Roughly $56 USD$ for a vehicle. Click here for the cost and the current exchange rate (Pesos to USD$) via Banjercito (give it a few moments to load) When you land on this page, you may choose your language of preference, Español or Inglés (English) in the upper right hand corner of this page. Permanent Resident Card (Resident Alien). If you are a foreigner to Mexico, then you will need to provide a valid passport or Passport Card and the official document issued by the Instituto Nacional de Migración (National Immigration Institute). The following amounts are applied as a “Guarantee” or deposit to the Mexican Gov’t for the temporary importation of your vehicle into Mexico, and is based upon the year of your vehicle. You may use a Debit or Credit Card, issued in your name. This deposit will be returned to your account after the Vehicle Permit is cancelled, and must occur prior to your vehicle permits expiration date. Something to remember if using a Debit Card. Why does Mexico make us do this? The reason why Mexico requires this is simple, The cost of a new or used car in Mexico is expensive. Actually more expensive than the U.S. or Canada. Mexican citizens have to pay IVA (tax) on a vehicles purchase, and most cannot afford it. Consequently, many Mexicans just don’t pay the tax on an imported vehicle. Mexico then loses on the Importation Tax which amounts to millions! If you fail to return or cancel your vehciles permit prior to it’s expiration date, you will automatically forfeit the deposit that you paid based upon your vehicle value listed above. Remember, for all of your Mexico Tourist Auto, Homeowners, Motorcycles, Boats and International Health Insurance needs, please call us at 1-800-434-3966 OR Email us at ici@mxici.com or visit us at mxici.com to immediately issue your own policy. We appreciate your business, Like us on Facebook, and tell your friends! This entry was posted in Border Crossings, Mexico, Mexico Travel, Vehicle Permits and tagged Baja California Sur, Baja Norte, Banjercito, Cancelation of Permit, Cd. Juarez, Chihuahua, Hours of operation, Mexicali, Mexico information, Mexico Permit, Mexico Port of Entry, Mexico Tourist Auto Insurance, Monterrey, Nuevo Laredo, Port of Entry, Puerto Peñasco, Sonora, Tamaulipas, Tijuana, travel Mexico, Vehicle Deposit, Vehicle Permit on December 12, 2016 by admin. Mayor Oscar Leeser of EL Paso Texas announced today the itinerary for the El Paso Texas leg of Pope Francis visit. Some 450,000 attendees are expected to witness the Popes first visit to the El Paso-Cd. Juárez area. For those not able to attend the festivities and Mass in Juárez, then the next best thing is to join Pope Francis in El Paso’s Sun Bowl, where his Mass will be simulcast. There will be no Mass and no communion at this venue. Christian entertainers Tony Melendez and the diocesan choir will perform under the direction of Peter Kolar. Tickets will run $10 for parishioners and $15 for non-parishioners through he University of Texas (UTEP) box office. El Paso’s Sun Metro bus lines will play a large part in the transportation of thousands during the event, but the schedule or routes have not yet been determined. Next Tuesday El Paso’s City Council is scheduled to discuss this topic. For more information, you may go to Twonationsonefaith.com Or, you may call in EL Paso (915) 747 – 5234. If you are planning on traveling to Juárez to witness this remarkable event, please remember us for all of your Mexico Tourist Auto, Homeowners, Motorcycles, Boats and International Health Insurance needs, please call us at 1-800-434-3966 OR Email us at ici@mxici.com or visit us at mxici.com to issue your own policy via our easy and simple apps via your PC, tablet, or Cell Phone! We appreciate your business! This entry was posted in Popes visit and tagged diocesan choir, El Paso Texas, El Paso visit, For more information, Juarez visit, Mayor Oscar Leeser, Peter Kolar, Pope Francis, Tony Melendez on January 20, 2016 by admin. It’s getting closer and closer. Less than a month when Pope Francis scheduled arrival to the City of Juárez (Cd. Juárez) this February, the 17th. With attendance estimates at 450,000 you might want to start your travel plans if you wish to see or hear the Pope in person! Pope Francis arrival is scheduled at Juárez own Abraham González International Airport. From there he is scheduled to travel and to visit the prisoners and chapel at the Cereso state prison. Roughly a 25 mile human chain is being implemented to shield the Pope for his procession to Juarez. From Cereso the procession for the Pope and his entourage will then proceed to the local Fair Grounds known as El Punto. An alter for a Mass has been built for the scheduled Mass. 2. Arrive early in order to find your place prior to Pope Francis arrival. You will be one of many thousands who will be making this pilgrimage. These are the current schedules of the Ports of Entry that border El Paso Texas. ALL of them are scheduled to maintain a 24 hour pedestrian and Passenger lanes. Commercial lanes are subject to a different schedule. The 3 Texas Port of Entry’s are closest to the Juárez Fair Grounds where the Mass is scheduled. The Santa Teresa New Mexico Port of Entry acts like a loop that goes around Juárez and reconnects to the Chihuahua highway that goes directly in front of the Cereso state prison. This allows you to miss what is generally a lot of traffic. Would assume the traffic is going to be even greater on the arrival day for Pope Francis. If you are planning to take your U.S. registered car or truck, you need to purchase a Mexico Tourist Auto policy. Your U.S. car insurance is not recognized in Mexico. We would love to help you. This entry was posted in Popes visit and tagged Date of Pope Franics visit, Hours of Ports of Entry, Pope Francis visit, Popes schedule, Ports of Entry on January 19, 2016 by admin. Now airlines are given the go ahead, up to 110 flights already, from the U.S. to Cuba. Does Cuba recognize U.S. health insurance? We don’t know. We haven’t located any news about this very important issue. When visiting Cuba, is not the time to find out. If you hear of anyone who knows the answer to this question, please let us know, including the sources. We also need to know whether we can use it in our Blog. Who knows, it might help really help someone. We generally stick to the subject of Mexico, however, when I saw this, it peeked my interest. That and the fact that anyone could have visited Cuba by traveling through Mexico the entire time we (U.S.) had a travel blockade for decades. This entry was posted in Uncategorized and tagged Cuba, Flights to Cuba, Is health insurance good in Cuba on December 19, 2015 by admin. The City of El Paso Texas is all abuzz about Pope Francis visit early next year on a schedule that places the popular pontiff in Cd. Juarez between February 12 & 20th of 2016, leaning toward Juarez being the last destination on the itinerary. According to public information about the trip, he is tentatively scheduled to visit Ceros Prison #3, an unnamed Seminary, and possibly even a border crossing into sister city El Paso Texas. One of the primary themes to the Pope’s visit is to address the polarizing immigration issues that face both countries. This entry was posted in Popes visit and tagged Itinerary, Mexico visit, National Catholic Reporter, Pope, Pope Francis, schedule on December 17, 2015 by admin. Since first making news in early 2014, the concept is now a reality. Saving hours in international crossing times, as well as hooking up U.S. citizens to cheaper Mexican air fares, the Cross Border Xpress is now open! This pedestrian bridge is the first to join a site with a foreign airport. The bridge is currently free until the 18th of December. Then tickets will go on sale for $18 each way, with long term parking, at least on the U.S. side, at $10 a day. Long Bridge wait times, and lower air fares to and from TJ were two factors driving this project. Obviously those using this wonderful bridge aren’t going to need the Mexico Tourist Auto or the U.S.A. Tourist Auto, but when traveling anywhere out of the country you should seriously consider the International Health & Accident. Click here for more details. This entry was posted in Border Crossings and tagged Cross Border Xpress, International Health & Accident Insurance, Mexico Insurance, Operation Hours, Pedestrian bridge, San Diego, Tijuana Airport, TJ on December 15, 2015 by admin. It’s official. Pope Francis is scheduled to visit Cd. Juarez, which is located directly across from El Paso Texas. Sometime between February 12th and the 20th of 2016, the Pontiff stated that the Papal visit to Cd. Juarez is the last of four scheduled visits to Mexico, something he wanted to do as far back as last September. Juárez Mayor Enrique Serrano Serrano urged Juarenses to prepare themselves and invited them to open their homes to family members from out of town who plan to travel to Juárez. Mayor Serrano said all of the municipal gymnasiums will be open on the day the pope visits and will be used as shelters for visitors who cannot find a hotel room to spend the night. Local hotels and motels, including those in El Paso Texas, expect full occupancy. It does not appear that El Paso Texas will be on the list of scheduled visits to the border region, but is expected to host many who make the trip. If you want to see Pope Francis, and not have to spend a lot of money or time to do so, then this will be an excellent opportunity to do so. Make plans today. If traveling by car to Mexico, visit here to view what is needed to cross into Mexico and return to the U.S. This entry was posted in Insurance, Mexico Insurance, Mexico Travel, Popes visit, Uncategorized and tagged Catholics, Chihuahua, Ciudad Juarez, El Paso, Hotels, Insurance Coverage in Mexico, Juarez visit, Passports, Pope, Pope Francis, Popes itinerary, Travel requirements, Visas on November 27, 2015 by admin. Pope to Mexico! What you need to visit Mexico. It’s somewhat official! Pope Francis intends on visiting Mexico, preferably in the coming new year. It was also mentioned, though not confirmed by the EL Paso Times newspaper, that Cd. Juarez may be on the Popes itinerary. Our local Catholic Bishop, Mark J. Seitz, is said to be “cautiously optimistic” about a visit to Cd. Juarez. What a marvelous opportunity to witness this world event. If you plan on seeing the Pope while he is in Mexico, then you have to plan for your visit to Mexico. If you are traveling by car, and the border area is on his itinerary, then the requirements are very simple. * Everyone must posses a valid Passport from their country of citizenship to return through U.S.
* You must purchase a vehicle permit at roughly the 26 kilometer checkpoint if traveling from Cd. Juarez to Chihuahua. Upon returning to the U.S. from Chihuahua you must, and this is really important, you must have the vehicle permit removed, no exceptions. If you do not, then your name is not removed from their entry computer system and the next time you travel into Mexico, it could cause you real headaches. We would be delighted to answer your questions, comments or concerns. Remember, for all of your Mexico Tourist Auto, Homeowners, Motorcycles, Boats and International Health Insurance needs, please call us at 1-800-434-3966 OR Email us at ici@mxici.com or visit us at mxici.com to issue your own policy. We appreciate your business! This entry was posted in Border Crossings, Popes visit, Vehicle Permits and tagged CHIH, Chihuahua, Ciudad Juarez, Mexico, Pope, Pope Francis, Travel requirements, U.S. passport, Visit on November 13, 2015 by admin.